At this moment, a large number of the hundreds of thousands of professionals who communicate for a living are struggling with something they're writing. No, they don't have writer's block and they certainly know how to construct a sentence. So what's the problem? The audience they're writing for is going, going, gone...Today's consumer doesn't want to read anymore, they're already overwhelmed by overflowing e-mail, millions of web pages and 24/7 news proliferation. 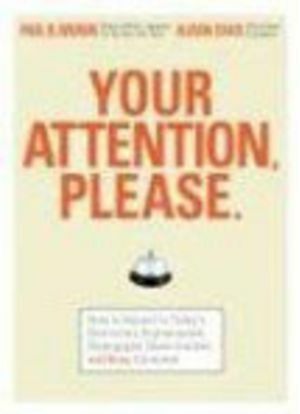 Your Attention Please is the new strategy guide for writing to the reluctant reader. It shows beleaguered communicators who the new audience is, how to reach them and how they must write differently, or risk losing mindshare and marketshare. Paul B. Brown (Boston, MA) writes the "What's Offline" and the "Off-The-Shelf" columns for The New York Times. A former writer and editor for Business Week, Financial World, Forbes and Inc., Alison Davis (Glen Rock, NJ) is the co-founder and CEO of Davis & Company, a leader in employee communication consulting.